Undergraduate research in the spotlight! The Langkilde lab was well-represented at this year’s Undergraduate Research Symposium by three of our lab researchers! It’s been an excellent year for undergraduate research. Congratulations to Richard Novak, Kristen Sprayberry, and Andrea Racic on their poster presentations! Not pictured is Jennifer Heppner, who also completed a brilliant thesis in the Langkilde lab this year. It’s been a pleasure having you all in the lab, and we will be sorry to see you go – but look forward to hearing about your future endeavours! Categories: Articles and Presentations, Uncategorized, Undergraduate Research | Permalink. My name is Richard Novak and I am finishing up my freshman year. I am in the Schreyer Honors College and I am studying Wildlife and Fisheries Science, with the Fisheries option. This is my second semester working in the Langkilde Lab. In fall 2017, I began working under Dr. Chris Howey as a research assistant helping with rattlesnake gestation site video monitoring. Currently, Dr. Howey and I are working on a study with macroinvertebrate communities in vernal pools and how they are impacted by prescribed fire. I was fortunate to receive an Erickson Discovery Grant which will allow me to continue working on this project into the summer. So far, I have developed my research questions and data collection methods, and I have been gathering data throughout spring semester. This research experience has been valuable to me for several reasons. First, I have been able to get a first-hand look at the entire experimental design and execution process, something I can only read about in classes. Additionally, interacting with graduate students and other faculty has been very influential when thinking about my future ambitions and career path potentials. The purpose of this study is to compare macroinvertebrates communities in vernal pools with varying fire histories. Fire is being used as a forest management tool, which will create a more open landscape that some wildlife species may prefer. Additionally, these prescribed fires may promote the growth of new vegetation and increase food for wildlife within the forest. I am looking at water samples from 12 vernal pools; three that were burnt over once (in 2016), three were burnt and mowed over (in 2016; this is an additional disturbance to the landscape), three pools burnt over twice (in 2014 and 2016), and three vernal pools from a control group with no recent fire or disturbance history. Specifically, I would like to answer the question, “do prescribed fire practices alter the macroinvertebrate communities of vernal pools?” This question has been relatively unexplored in previous research. But preliminary data collected by Chris suggests that physiochemical (physical and chemical) characteristics of these pools are different, which could lead to differences in what macroinvertebrates are able to survive in these pools. I will analyze water samples collected from these vernal pools for macro-invertebrates, identify all macroinvertebrates found to family, and determine abundance of each family. The water samples that I have been going through now were collected in 2016, and additional samples will be analyzed from 2017 that are currently being collected. I look forward to getting out in the field this summer and assisting with measurements and collections. This is what my lab bench typically looks like while I’m collecting data. My sorting tray with a sample spread out to the left, a hand-held magnifying glass, dissecting microscope, and the computer with my spreadsheet in the background. Note, there are also plenty of macroinvertebrate books to help me identify everything I find. When I first began this project, I had to learn how to identify the macroinvertebrates to family. One of the reasons I am interested in macroinvertebrates is because of my interest in fly fishing, which requires basic knowledge of aquatic entomology, so I had some ID skills to bring to the table. I practiced using dichotomous keys to identify the specimens, a task I found time consuming but very learnable with practice. Now, I am very familiar with the families that I encounter most often. As of right now, I have identified the presence of over 20 families of macroinvertebrates among the vernal pools in the study. I find a lot of mosquito larvae (Culicidae), phantom midges (Chaoboridae), cased caddisflies (Limnephilidae and Odontoceridae), as well as several families of dragonfly and damselfly. To me, the coolest creatures that I find are fairy shrimp (Chirocephilidae) and water-boatmen (Corixidae) although I don’t come across either of those frequently. Culicidae pupae. These will grow up to become the dreaded mosquito! Chaoboridae larva. These are also known as phantom midges. Limnephilidae larva. This is a type of caddisfly. Caddisflies are known to build these ‘houses’ out of sticks, leaves, and rocks within their environment. The actual larva is within this house made of sticks and you can see its head sticking out of the top. Different species of caddisflies will use different substrates to build their houses, so you can tell species apart based on the house materials. Odontoceridae larvae. These are another species of caddisfly. You can see that they use a different substrate material for their houses. Chirocephilidae larva. This is also known as a fairy shrimp and can be very common in many of Pennsylvania’s vernal pools. Corixidae adult. These are also known as water-boatmen. 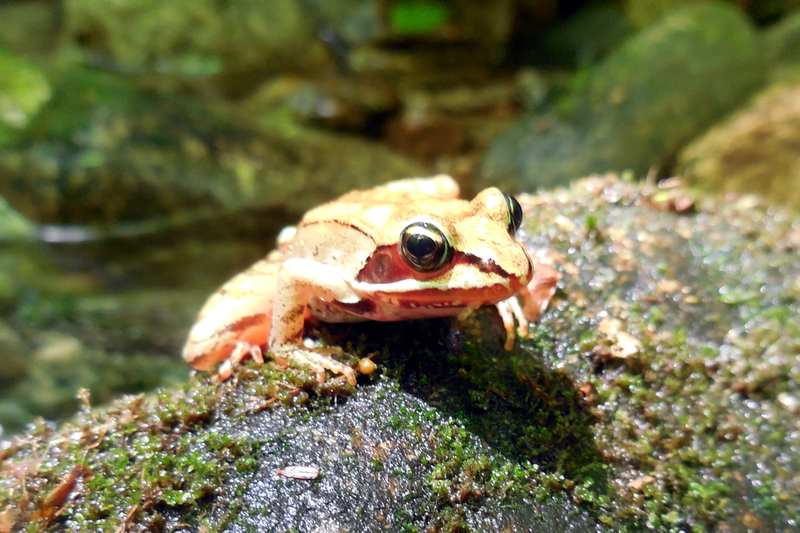 They are typically seen swimming across the surface of a vernal pool, but can dive to the bottom when foraging or escaping a would-be predator. So far, I am finding more mosquito larvae (Culicidae) in unburned pools. But among the burned pools, I am observing more mosquito larvae and caddisflies (Limnephilidae) in pools that were more disturbed (burned and mowed). This trend among the vernal pools is interesting, because that mow was an extra disturbance on top of the burn, yet these two families appear to be doing better in these pools. Please note though, these data are still being collected and these results may not accurately represent our final findings once we have analyzed all water samples. Preliminary data for our macroinvertebrate communities within the four different treatments. In the future we will compare species diversity and richness among vernal pools. We will also see if there are any correlations between species presence/absence from vernal pools and the physiochemical characteristics of those pools. Working on this project has been useful to me for many reasons. I have had a lot of fun sorting through samples and looking at the macroinvertebrates; it really never gets old to me which is good because I’ll be staring at trays a lot more this summer. It has been very satisfying to see my very own data begin to build on the spreadsheet as I work. Also, being around other lab members has given me a look into what school is like for graduate students. My freshman year is coming to a close, and I hope to take on new and exciting projects throughout the rest of my undergraduate career. When I came to college last fall, I did not expect to become involved in research right away, but I am very glad I took that step early and I have been fortunate in the opportunities presented to me. After graduating, I plan to pursue at least a master’s degree in a biology related field. I am interested in working for a natural resource management agency, although this experience has opened my eyes to the possibility of university research as a career. Whatever happens, my goal is to continue exploring more about biology and the organisms that fascinate me so much. Me looking hard at work keying out macroinvertebrates! Categories: Research in PA, Undergraduate Research | Tags: Communities, controlled burn, disturbance, ecology, Fire, Macroinvertebrates, prescribed fire, Summer 2017 Field Work, vernal pool | Permalink. Racing baby lizards (for science)! In the latest chapter of the “bearded lady” saga (female fence lizards bearing ornamentation that is typical of males), we continue to investigate what potential advantages these “unattractive” females could have that allow them to persist in high numbers. We know that in many species, colorful, conspicuous ornaments have a tight relationship with levels of particular hormones (such as testosterone), which themselves are related to physical performance. One of our current guesses is that even though females bearing male-like ornamentation are not prime sexual partners in the lizard world, their offspring might be more physically competitive than offspring of the more desirable females (read more here). The costs and benefits of both strategies could be responsible for the coexistence of the two! A good way of measuring the physical performance of an animal is by how fast they can run. With the help of two enthusiastic undergraduate students, Maggie Zemanek and Sean Dailey, I am recording slow-motion videos of juvenile lizards running on a race track. This will help us calculate how fast each of them can run, and compare that to what their moms looked like: are the faster runners offspring of ornamented females? Maggie, Sean and I still have a lot of juvenile lizards to race, but hopefully we’ll find some interesting patterns in our experiment. Stay tuned! Categories: Research in PA, Undergraduate Research | Permalink. One in a continuing series of posts highlighting the work of undergraduate researchers in the Langkilde Lab. My name is Michaleia Mead, and I am a senior in Wildlife and Fisheries Science, Wildlife Option. This is my first year working in the Langkilde Lab. I spent the summer 2015 working for the lab on maternal stress of Eastern Fence Lizards. But currently, in my research under Dr. Chris Howey, I am looking at ecological trade-offs between thermal quality and risk of predation at timber rattlesnake (Crotalus horridus) gestation sites. A gestation site is the area that a female snake spends the duration of her pregnancy in from early spring, and throughout the summer to parturition (birth of the litter). These sites typically receive a good deal of sunlight and allow the female to maintain an elevated, preferred, body temperature. An adult female found basking at a gestation site later in the year. A neonate rattlesnake found at a gestation site. Note the size of the neonate as it is hiding under a small birch leaf. Neonates will typically remain at the gestation site for about 1 week, basking in the sunlight, prior to following their mother to a nearby den site. The “openness” of gestation sites range from very open to densely forested sites, enclosed by many tall trees. For this study, we identified three sites that were very open and three sites that were more enclosed. We compared the canopy openness, thermal quality, and risk of encountering a predator between these two types of gestation sites. In particular, we are comparing the relationship between site openness and thermal quality as well as site openness and the probability of timber rattlesnakes encountering a predator. Thermal quality is the amount of time that the range of temperatures a rattlesnake prefers overlaps with the temperatures that are available (thermal quality would be better at a site if it provided more time when available temperatures overlapped with preferred body temperatures). I am testing the hypotheses: 1. Thermal quality of the open sites would be better due to a greater percentage of time that the available temperatures would exceed preferred temperatures, and 2. Risk of encountering a predator would increase as site openness increases. Cameras were placed at each of the six gestation sites to monitor rattlesnake behaviors and occurrence of potential predators traveling across gestation sites, despite the fact that bears sometimes take our cameras out…jerks. We also placed biophysical models at each gestation site to measure the available body temperatures at those sites. Via these cameras, I’ve observed potential predators and also documented potential food sources for the rattlesnakes, such as chipmunks. We’ve determined that open gestation sites are in fact warmer than more enclosed gestation sites, and the thermal quality of these sites is better. The improved thermal quality of these open gestation sites may lead to shorter gestation times by gravid females, more successful reproductive bouts, and increased population health. Contrary to our second hypothesis, we do not see more predators at more open gestation sites; however, we do see more predators as the overall area of the site increases. 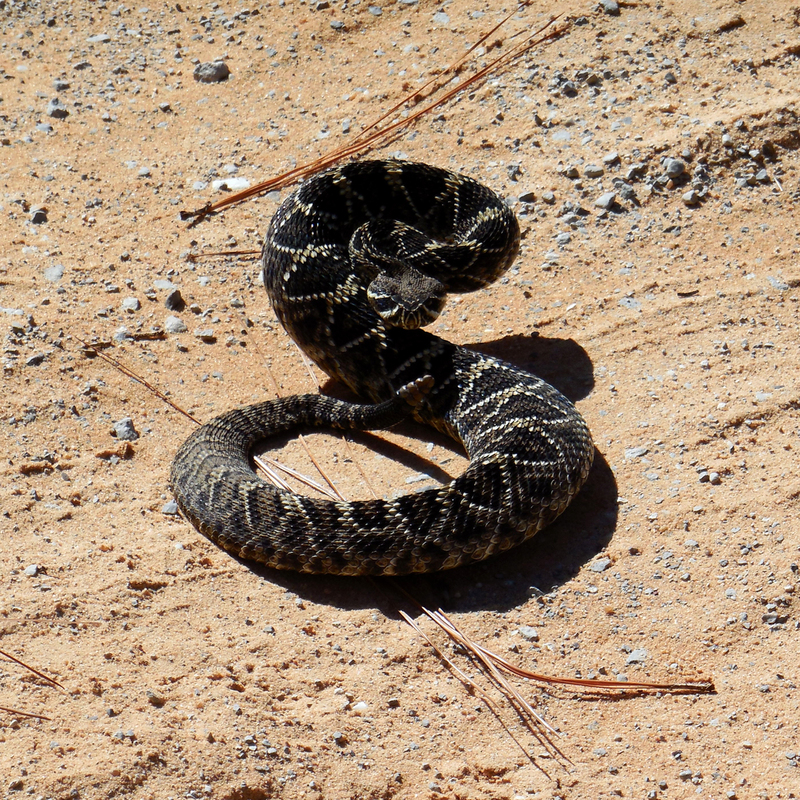 This suggests that we may increase the openness of gestation sites in order to improve thermal quality for rattlesnakes, and, as long as we do not increase the overall open area on the ground, risk of encountering a predator should remain constant. All of the data have not been analyzed, but they are showing signs of supporting the first hypothesis. I am currently working on writing a manuscript for these data and should be completed sometime in late January. A red-tailed hawk swoops in on top of a foam timber rattlesnake model (not seen). A yellow-morph timber rattlesnake model is pictured behind the hawk. Snakes will retreat to the den as predators approach. This research is proving to be important to the scientific community because we are beginning to see some behaviors that have never been documented before. For example, we are finding that rattlesnakes are very active around the den for at least a couple weeks prior to hibernation. Additionally, prior to exiting the den, rattlesnakes appear to stay under the overhang of the den and observe their environment. We are unsure if this observation behavior is to test the thermal characteristics of the environment or to look out for predators. In addition to this, the study may provide insight into what snake age is the preferred prey of predators within the community. Snakes varying in age from neonate to juvenile and adult have all been seen coming in and out of multiple den sites that have been studied via different cameras that have been set up facing four different rattlesnake den sites located throughout Pennsylvania and New York. From these cameras, we are able to see predators that visit the den as well as the behavior of rattlesnakes as they enter and exit the den during the day. While collecting data, this is what the view of the den from the camera looks like. Can you spot the rattlesnake in this picture from one of our trail cams? In this case, the rattlesnake is only a few feet from the mouth of its den. In the pictures above we are actually able to see two adult rattlesnakes basking right outside two of the den sites under question. While right now the study is still in its preliminary phase of data collection, we have already observed some interesting trends between snake activity and temperature. For example, snakes tend to be active outside of the den during both the day and night until ambient temperatures reach a specific threshold (roughly 42 degrees F). Some of these activities appear to be basking behaviors, however, night time activities are unknown. As of right now, we are not seeing any trends between predators and specific age-related prey choices, and we have not recorded any predation events. We hope to be finished data collection by the end of December and have a paper reporting the results completed by May. Stay tuned, as we’ll publish a follow-up here with our official results! Categories: Undergraduate Research | Tags: den, predator, rattlesnake, temperature, Timber Rattlesnake | Permalink. My name is Jill Newman, and I’m a Langkilde Lab alumni. I came to the lab as a Research Experience for Undergraduate (REU) student during the spring and summer of 2012. During my six-months with Tracy’s lab, I did some cool things including working on several different graduate student projects, co-authoring seven manuscripts, and exploring a state that I never really saw myself going to: Alabama. It was a really unique opportunity that I was able to experience as an undergraduate student! I graduated from Northeastern University in Boston, MA in August 2013. Northeastern likes to boast that 90% of its graduates become employed or enrolled in graduate school 9 months after graduation. Feeling the “pressure of being a statistic” on my shoulders, I applied to tons of jobs and explored the option of graduate school. After 8 months of painful unemployment, I became one of Northeastern’s “90%-ers” when I accepted my first field technician job out of college. Down on the Florida panhandle, Virginia Tech works with an interesting species of amphibian called the reticulated flatwoods salamander. Listed as Endangered by the USFWS, reticulated flatwoods salamanders are a species of interest because they are very dependent on their habitat (longleaf pine, ephemeral wetlands, and likely fire suppressed areas). Virginia Tech’s study is looking at metamorph and adult movement to and from breeding ponds. As an amphibian tech, I surveyed for these salamanders using drift fences/funnel traps. I captured, measured, VIE-tagged (basically giving salamanders a tattoo! 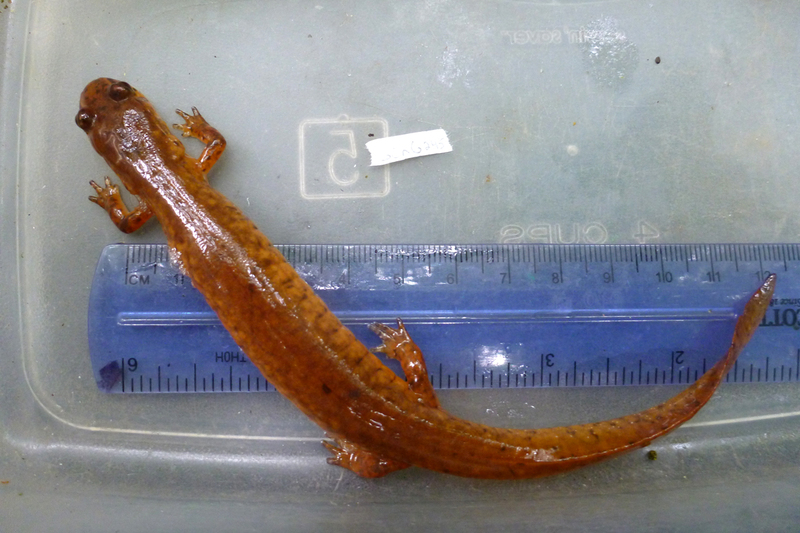 ), and PIT-tagged salamanders for a multi-year mark-recapture study. In my opinion, many of the “cool” herp jobs are down South because the southern states have a much wider diversity of herpetofauna. However, when an opportunity to work in the White Mountains of New Hampshire arose, that was very difficult to turn down! For this project, we were interested in looking at species dispersal and species interactions in an aquatic system. We conducted stream salamander surveys in which half of the streams were known to have brook trout and half of them did not. We captured, measured, and VIE-tagged salamanders for a mark-recapture study. For more information about this project, check out the Lowe Lab! Immediately following my New Hampshire job, I was rehired by Virginia Tech to go back to Florida to work on their gopher tortoise project. The gopher tortoise is a keystone species in the Southeastern U.S. because it digs burrows that provide shelter for over 300 other species! However, USFWS has this species listed as Threatened for reasons including habitat loss, pet trade, human consumption, relocation, and disease. For this tech position, we used occupancy models to survey gopher tortoise populations where their population is known to be in heavy decline. 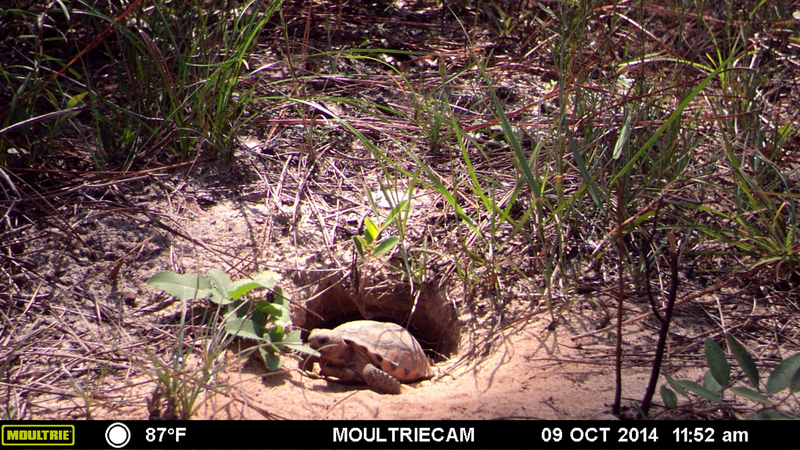 We also used camera traps to check gopher tortoise burrows for activity levels and for commensal species. Eastern diamondback rattlesnake, Crotalus adamanteus, redemption picture…make sure Sean Graham sees this! 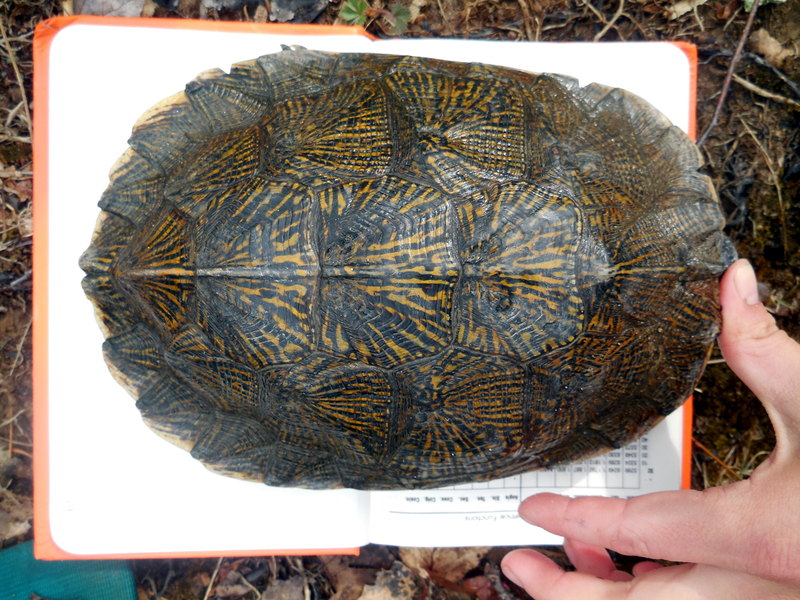 Another really unique opportunity that I had was working for the Smithsonian Conservation Biology Institute Wood Turtle Ecology Department. Wood turtles are endemic to North America and are listed as an endangered species. These turtles obtained their conservation status as a result of habitat destruction, agricultural accidents, and road traffic. I had the opportunity to stream survey and radio-track these turtles as part of a 20-year-long mark-recapture study. We tracked male and female turtles as they made large movements across landscapes. This is important for management purposes because over the course of these “large movements,” turtles will occasionally change watersheds (making it imperative to protect multiple watersheds). Sometimes as a field tech you feel like you’re in this “never-ending loop” of traveling around every few months and constantly meeting new people that you may never see again. It can be very difficult at times but there is a lot to gain from these types of jobs. First, you gain important wildlife skills that prepare you for graduate school (if you choose that route), and second, you have the chance to network with great people from all across the country. It’s a challenging but often necessary step before entering the field of wildlife biology. In my case, the diversity of experiences from my undergraduate and technician positions have paid off. This fall semester, I’m joining Dr. Kyle Barrett of Clemson University to pursue my Masters of Science in Wildlife and Fisheries Biology. My thesis is still in the works, but I will be surveying target herpetofauna in the Blue Ridge Mountains of South Carolina for the South Carolina Department of Natural Resources. This is a great opportunity for me to apply skills that I’ve learned in my past field experiences. Additionally, it’s also a fantastic way for me to learn new skills in the field and classroom. Furthermore, I am also very excited for my first college football game (no offense, Northeastern)! My opportunity with the Langkilde Lab opened many doors for me when I graduated from college. I’m very appreciative of the chance and great honor to have been an REU student in this lab, and I really enjoyed working with Tracy and all of her graduate students! I would highly recommend that all undergraduate students do an internship/co-op/REU if possible. The more experience you can get earlier on in your career the better off you will be! 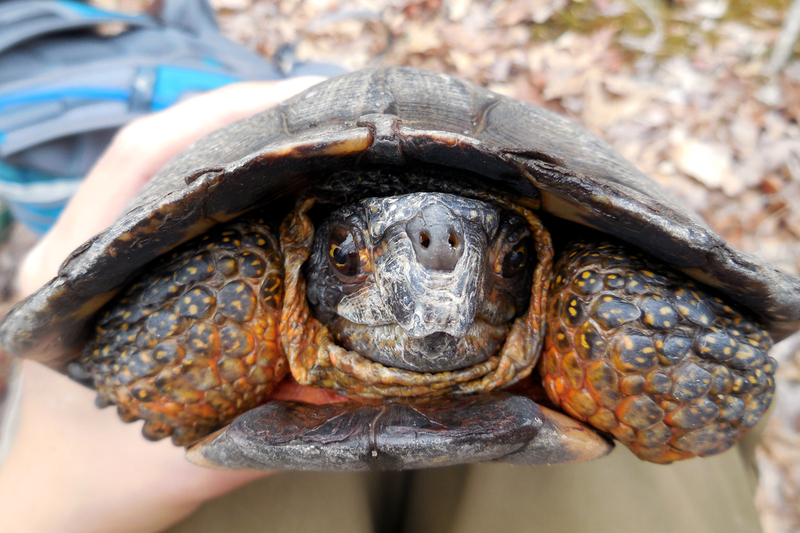 Categories: Undergraduate Research | Tags: Clemson, flatwoods salamander, gopher tortoise, graduate school, Northeastern University, research tech, REU, wood turtle | Permalink.